Download and share these posters on Seychelles endemic and special flora and fauna. The Seychelles Islands are home to many species that are found nowhere else – we call these endemic species. A unique flora and fauna has evolved here. There are no land mammals occurring here naturally, which has allowed particular kinds of biodiversity to develop. The mammals brought by human settlers, particularly rats, mice, cats and tenrecs, have been disruptive to the vulnerable species here, and have presented major challenges to conservation. There are fourteen endemic species of birds in the Seychelles. These are unlike birds that are anywhere else in the world. They have the word “Seychelles” in them. 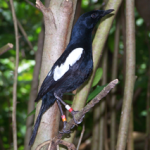 The attached poster has names and pictures of some of the endemics including the Seychelles Magpie-robin (pictured), Seychelles Warbler, Seychelles Owl and Seychelles Kestrel. Some threatened endemic land birds in the granitic Seychelles have made a wonderful recovery from the brink of extinction such as the Seychelles Warbler and Seychelles Fody, thanks to conservation actions. However, many are still in danger. 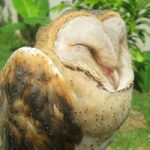 Their conservation status in monitored by the World Conservation Union (IUCN). The birds on this poster are still on the list of threatened species. 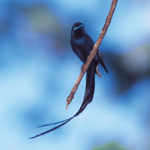 They include the Seychelles Paradise Flycatcher pictured here. Having traveled the sea for over 100 million years, marine turtles have outlived almost all pre-historic animals with which they once shared the planet – even surviving the extinction of dinosaurs. But today, three of the seven existing species are critically endangered with extinction, three are endangered, and the status of the seventh species is unknown. This poster tells the story of the two main species that nest in the Seychelles. The Seychelles has twelve species of Amphibians, out of which eleven are endemic. It is also home to an endemic family of frogs called Sooglossids. The family Sooglossidae consists of 2 genera and 4 species of frogs found only on the granitic islands of the Seychelles. This poster contains information about the Sooglossids, the Seychelles tree frog and Seychelles caecilians. Seabirds are adapted to life at sea, catching fish for food. Many have waterproof feathers and webbed feet and feed by diving for their prey. Some sea birds (like Sooty tern and Frigate birds) are long-distance fliers, spending most of their life at sea, many miles from land, while others (like Fairy Terns) feed closer to shore. However, all seabirds have to return to land to nest and raise their young. The best places for them to breed are small islands with no introduced predators like cats or rats. About 2 million species of marine animals live in coral reefs. Seychelles has an Exclusive Economic Zone of 1.3 million km2 of ocean. This large marine territory of the country is host to highly abundant and diverse marine life. Seychelles has 23,00o hectares of protected reefs and marine areas. There are more than 1,000 species of fish that occur in Seychelles waters. 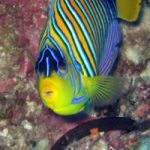 Coral reef fish are a very important resource for tourism, nutrition and science. It is fascinating to learn about these beautiful creatures, their survival and adaptation in the very dynamic world of coral reefs. This poster presents some common species living in Seychelles coral reefs that you can easily see when you go snorkeling or diving. 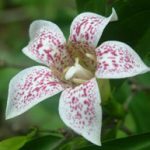 There are about 850 species of flowering plants in Seychelles, of which, 250 species are indigenous including 75 endemic species (meaning they are found only in Seychelles, nowhere else). The rest are introduced species. Many introduced species have become invasive and put many endemic species in danger. 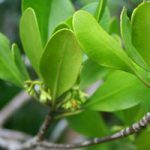 Conservation action is needed to save these special endemic plants that are only found in Seychelles. Invasive species are one of the greatest risks to biodiversity. They are right up there with habitat destruction in terms of threat. 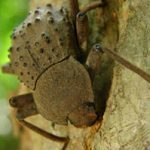 Why are we so bothered with alien species? The physical isolation of oceanic islands like Seychelles has led to the evolution of very specialised and unique ecosystems. With increased human and other traffic, the role of the ocean as a barrier to plant and animal dispersal has diminished. This has increased deliberate and accidental introductions of alien species into once-remote island environments. Species on islands are very vulnerable to competition with and diseases of aggressive mainland species. The islands of Seychelles provide many examples of the nasty impact invasives can have. One obvious example is the forests of Mahe, now dominated by introduced tree species. 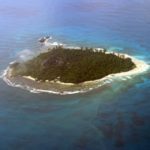 Most native land bird species no longer survive in these forests, being now restricted to a handful of the smaller islands, where a safer and more intact native habitat still exists. Cousin is a small 27 hectare Granitic island. Situated 2 km from Praslin Island. Until the late 1960s Cousin was a plantation of coconuts and other crops with domestic animals running loose. Wildlife was exploited for food and for sale. By 1959, the status of wildlife on Cousin was seriously depleted. 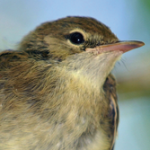 The revelation that the last surviving population of the Seychelles warbler, numbering only 26 birds, was confined to the island, rallied conservation efforts. 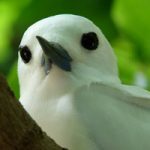 In an attempt to save the Seychelles warbler, the International Council for Bird Preservation (now Birdlife International) purchased Cousin for conservation in 1968 by funds raised from an international campaign. In 1959, the endemic Seychelles warbler was one of the world’s rarest birds. The establishment of coconut plantations on the Seychelles had resulted in massive levels of habitat destruction. As a consequence the warbler had been wiped out from most of its original range. Between the 1950s and 1990s, the whole world population of Seychelles Magpie Robins was restricted to Frégate Island and at times came very close to extinction, it was classed as critically endangered in the IUCN’s Red List of Threatened Animals. Conservation action saved both species from becoming endemic. This poster captures this success story.